The latest red-hot romances from Mills & Boon Modern! Crowned for the Sheikh's Baby by Sharon Kendrick The last thing sensible maid Hannah Wilson expects is to be whisked off to a glamorous party by Sheikh Kulal Al Diya. Their intense chemistry and searing kiss leads to the most amazing night of her life—with the most shocking consequences! Now Kulal will do anything to claim his heir. Even if it means making Hannah his desert queen! The Secret The Italian Claims by Jennie Lucas Cristiano Moretti is furious that Hallie hid the consequences of their hot night together! He will not inflict his own childhood abandonment on his son, and demands that Hallie marry him. Soon they realise the passion between them is as powerful as ever...but when all Hallie wants is a real family, will Cristiano's seduction be enough to secure his legacy? 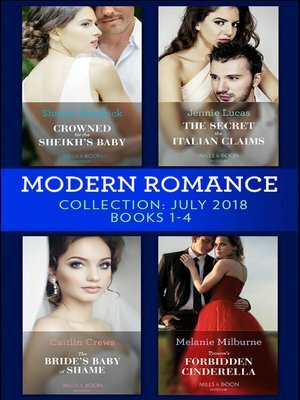 The Bride's Baby of Shame by Caitlin Crews Dutiful heiress Sophie has never challenged her gilded existence, even agreeing to a convenient marriage at her father's command. Until she meets ruthless Sicilian Renzo—one carnal night awakens unimaginable desires, and leaves her pregnant! When Renzo uncovers her secret, he'll stop at nothing to legitimise his child—including storming Sophie's wedding and stealing her as his own bride! Tycoon's Forbidden Cinderella by Melanie Milburne Love is a weakness that billionaire Lucien Fox refuses to indulge in. But delectable Audrey Merrington tests his formidable control! With their families united by marriage, Audrey has always been utterly off-limits, yet her shy innocence holds an enticing appeal for cynical Lucien. When a scandal forces them together, Lucien proposes a temporary solution to their inconvenient craving—total, delicious surrender!